French critic and composer Michel Chion argues that watching movies is more than just a visual exercise--it enacts a process of audio-viewing. The audiovisual makes use of a wealth of tropes, devices, techniques, and effects that convert multiple sensations into image and sound, therefore rendering, instead of reproducing, the world through cinema. The first half of Film, a Sound Art considers developments in technology, aesthetic trends, and individual artistic style that recast the history of film as the evolution of a truly audiovisual language. The second half explores the intersection of auditory and visual realms. With restless inventiveness, Chion develops a rhetoric that describes the effects of audio-visual combinations, forcing us to rethink sound film. He claims, for example, that the silent era (which he terms "deaf cinema") did not end with the advent of sound technology but continues to function underneath and within later films. Expanding our appreciation of cinematic experiences ranging from Dolby multitrack in action films and the eerie tricycle of Stanley Kubrick's The Shining to the way actors from different nations use their voices and words, Film, a Sound Art showcases the vast knowledge and innovative thinking of a major theorist. Michel Chion is a composer of musique concrete, a filmmaker, an associate professor at the Universite de Paris, and a prolific writer on film, sound, and music. 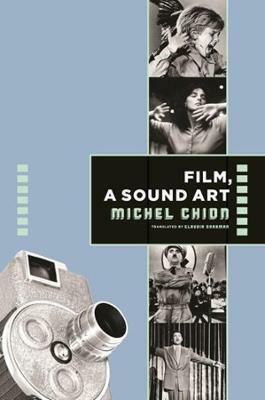 His books with Columbia University Press are The Voice in Cinema and Audio-Vision: Sound on Screen. Claudia Gorbman is a film studies professor at the University of Washington, Tacoma. She is the author of Unheard Melodies: Narrative Film Music, the editor of several books, and the author of many articles on film sound and film music. She is also the translator of Michel Chion's The Voice in Cinema, Audio-Vision: Sound on Screen, and 2001: Kubrick's Cinema Odyssey.